Last year, I tapped into the wisdom of a few readerly friends to help me put together the 2015 Summer Reading List, but this year I’m going it alone. Why? A year or so ago, I made a deliberate effort to start reading more - at least two books a month. Mostly, I did this to stay off social media and I've pretty much kept pace since. Of the books I’ve read since the, these are my favorites (they were some clunkers). So I can personally recommend you crack open these books before dozing off on the beach this summer. Dead Wake - You know how it’s going to end (The Lusitania sinks), but still the narrative manages to grab you and doesn’t let go. History books aren't usually page turners, but Larson is a master of his craft and the pages in Dead Wake seem to turn themselves. Celine - The newest from Peter Heller, the author of The Dog Stars (one of my favorite novels), Celine follows a private detective on what could be her last, and most important case yet. The story flashes between the mountain west, Long Island Sound and New York, three of my favorite places in the country. So far, this is my favorite book of the year. 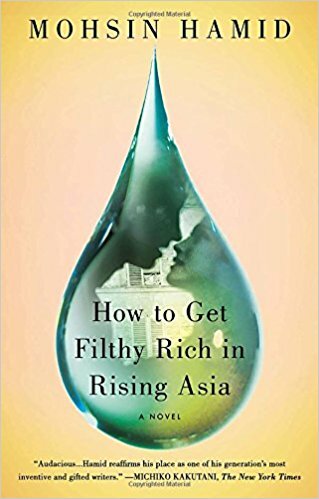 How to Get Filthy Rich in Rising Asia - Not what it sounds like. This love story is set in an unknown city in Asia and written in the second-person and absolutely delightful to read. Also, see Hamid's newest: Exit West. The North Water - Fans of Cormac McCarthy will probably like this gory and brutal story set on a whaling ship in the frigid waters off of Canada. I did, even though it gave me freaky dreams. Loon Lake - The great American story of rising up from nothing told in a way like it’s never been done before. The first 30 pages alone comprise more action than most 500-page books. But that’s E.L. Doctorow for you. A Moveable Feast - Because it’s summer and because it’s Hemingway. If you haven’t picked up his last work, which recounts his time struggling as a young writer in Paris, I truly recommend it. For creatives, it may give you the motivation you need to push through hard times, for everyone else, this is a beautiful look at an interesting and troubled man. Read all of The Hand & Eye Book coverage here.